The Marquette Board of Light and Power has earned a Reliable Public Power Provider RP3® Diamond Level designation from the American Public Power Association for providing reliable and safe electric service. David Lynch, Assistant Director of Utility Operations at Marquette Board of Light and Power and Chair of the Association’s RP3 Review Panel was presented the Award on May 8, 2017 during the Association’s Annual Engineering & Operations Technical Conference held in San Antonio, Texas. Pictured (l-r) presenting the award is Rick Aguilar, Kansas Municipal Utility Association, David Lynch, and Michael Hyland, Vice President Engineering & Operations, APPA. The RP3 designation, which lasts for three years, recognizes public power utilities that demonstrate proficiency in four key disciplines: reliability, safety, workforce development and system improvement. Criteria include sound business practices and a utility-wide commitment to safe and reliable delivery of electricity. This is the second time, MBLP has earned the prestigious Diamond Level designation from the APPA, by scoring a perfect 100 points. The MBLP is one of only 44 municipal electric utilities nationwide to earn The Diamond Level designation. “Utilities that have earned an RP3 designation demonstrate public power’s emphasis on achieving leading practices and providing a high level of service to communities,” said Lynch. 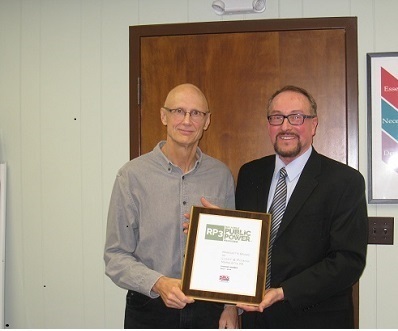 Pictured on the left is Tom Tourville, MBLP's Board Chair accepting the RP3 Award from Executive Director, Paul Kitti at their May 9, 2017 Board Meeting. On May 19, 2017 in Lansing, BLP's Executive Assistant/Community Relations Coordinator Noreen Collins received the 2016 Gatekeeper of the Year Award from the Michigan Commission on Services to the Aging for her outstanding service representing this program. In a letter from Governor Rick Snyder, Ms. Collins was recognized and congratulated for her exceptional acts in the interest of helping others. This program is to help senior citizens in our communities by coordinating needed services to protect vulnerable and older adults. Pictured above (l-r): Chair of the MI Commission on Services to the Aging Dona Wishart, Noreen Collins, Commissioner Jerry Irby and Deputy Director of Aging & Adult Services Agency Scott Wamsley.